In launching our new web site, we found our first blog post from almost 8 years ago! A lot has changed since we first opened up shop in a small rental space. More than 7 years later, we have gained 3200 square feet, have learned a lot about fashion, opened a men's selection, gained buying experience and have had the opportunity to meet INCREDIBLE people! We are blessed in that we still enjoy our job, get to keep learning everyday and have the best customers and vendors ever! Sometimes you get a hunch….a feeling… a great idea that ignites interest and excitement. If you are lucky enough to listen and to trust, you may have the opportunity to see this idea grow and possibly become reality. This is how The Happy Sol started… a hunch, an idea and a whole lott’a excitement. 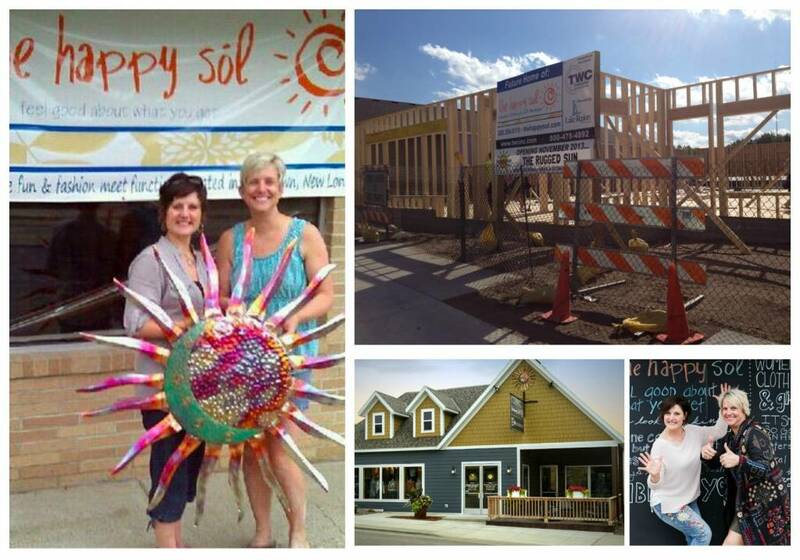 We are Stacey Roberts and Gina Lieser, the owners of The Happy Sol (unreal to say “owners” it just puts a smile on your face doesn’t it?) We first met when we began working together at United Way where we grew a passion for our community, met incredible people and accomplished great work. It was also where we realized the lack of a personal shopping experience that offered fashionable and functional clothing. After 5 years of working together, life transitions brought us to new phases and that is when the conversations started…We wanted to have a store, a boutique, filled with beautiful items as unique as the women in our lives. We wanted to have a place that intrigued the senses, that makes you feel excited to find treasures, and puts a smile on your face when you walk through the door. We wanted a store that made you feel good, that provided a little retail therapy that is good for the soul. This is how we created our name “The Happy Sol” a bright, feel good place with fun clothes, funky accessories and unique gifts. Next came the research, the business plan, meeting with community businesses, and the adventure of visiting boutiques around Minnesota ;o) With the incredible support and constructive questioning of our husbands, we were soon looking for space to rent and applying for a business loan. We are blessed to have found an incredible space in New London with an equally incredible landlord. Our amazing family and friends helped us build a beautiful space and we lept at the opportunity to fill it (be sure to see our Market Adventures for photos and stories about this magical mystical place). Now here we are; in the unbelievable position of preparing to open our front doors in a few short weeks. We are so excited to show our community, friends, family and passerby’s The Happy Sol. It was created to offer women a place to shop where you can be yourself, feel fabulous and have an experienced that is about you. The mission of The Happy Sol is to provide a total shopping experience for women of all ages. Bringing together unique clothing, gift items, jewelry and home décor in an environment that provides retail therapy that is good for the soul. We can’t wait to share our store with you- be sure to check our blog often for the newest items in stock, see the newest trends and to hear about our hilarious (at least we think they are) encounters all along the way.